If you’re new to wildlife holidays and not quite ready to hike through scorching deserts or sail in perilous seas to catch a glimpse of an endangered species, then Monterey is your perfect introduction vacation. Everything about a visit to Monterey is relaxed and easy. You don’t even have to leave the harbour in order to see the surprisingly large sea otters reclining leisurely whilst eating their invertebrate treats. And, if you’re feeling particularly laid-back, you can even wildlife watch from the comfort of a waterside restaurant. However, I’d recommend an ocean encounter by renting a kayak and going for a gentle paddle around the buoys, boats, seals and sea lions (please keep your distance from the sea otters as altering their behaviour can be harmful to them and is a violation of federal law). 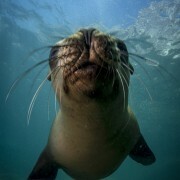 Even the diving in Monterey is uncomplicated. There’s a great site by the harbour with beach entry so you don’t have the hassle of boarding a boat. 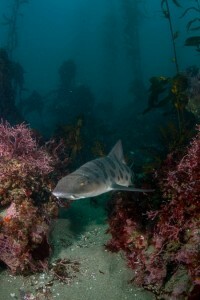 On these dives you can glide amongst the lazily undulating kelp fronds to look for resting leopard sharks and innocuous octopuses. In Monterey, many attractions are within strolling distance, the locals are gems and the tour operators have that golden American customer service attitude. My only warning; life will seem very hectic when you leave! Monterey is situated in Northern California, a 2 hour drive south of San Francisco on the Pacific Coast. You could happily spend an entire vacation kayaking, diving, whale watching and hiking in the local vicinity but if you’re interested in exploring the wider area, there is even more on offer. 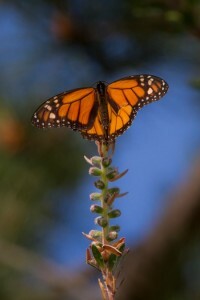 Pacific Grove is Monterey’s neighbouring city and is famous for monarch butterflies. Between mid-October and mid-February, the monarchs stop at this overwintering site and in peak season the trees are dripping with the beautiful winged insects. Just south of Monterey is Carmel (where Clint Eastwood was once mayor!) which is the locals’ surfing spot as well as being a dog-owners heaven. Further south still is Point Lobos State Natural Reserve which offers pristine wildlife watching opportunities without the boats and buildings of Monterey. And for truly breathtaking scenery, purple sand beaches and dizzying redwood forests, continue south on Highway 1 past Bixby Bridge to Big Sur where, if you’re lucky, you can spot the critically endangered California condor. 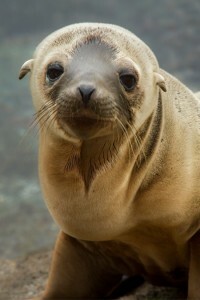 The one place that I would encourage everyone to visit is the world-famous Monterey Bay Aquarium. Not only can you learn all about the local marine life without even getting wet, you’ll become an expert in sea otter biology and find out how the population nearly went extinct due to overfishing. I was amazed at how the resident rescued otters use tools to crack open invertebrate shells, keep their favourite tools in the folds under their forelimbs and even pass tools on to their pups as a kind of inheritance! The Aquarium runs essential conservation programmes, including SORAC, where orphaned sea otter pups (who have been separated from their mothers and stranded on the beaches) are adopted by the resident females and learn all the skills they need to survive in the wild. This is a fantastic project as the pups can later be released to the wild which wouldn’t be the case if the pups were raised by humans. To get to Monterey, I flew to San Francisco and hired a car to drive down. I stayed at Hotel Abrego which is in an ideal place to walk to all of the local attractions and even has fireplaces in the rooms! I kayaked with Monterey Bay Kayaks, dived with Breakwater Scuba and whale watched with Princess Monterey Whale Watching. Monterey is fantastic to visit all year round but April and October are particularly nice and not too busy. You can rent any necessary gear for diving and kayaking from the providers.